Sometimes I just want to go and post things like, “SAIZEN. DAISO. GO. NOW.” But then, I know you guys will just want to go and kill me so I should offer more info. Well, the news is, Daiso, that Japanese chain of 100 yen stores has finally opened a store in Manila. Locally going by the name of Saizen, it’s the same Daiso chain you may have visited in Japan, Singapore and Hongkong. Someone already beat them to the trademark Daiso here, hence the need to go by a different name but hey, it’s the same gigantic wallet blackhole we’ve all gotten to know and love. 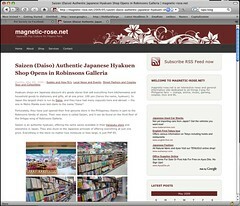 Personally, I haven’t been there so I’m inviting you to visit magnetic-rose’s shop report. All her tales (THEY HAVE BENTO STUFF!) and photos have me drooling so you’ll probably see me over at their maiden store at the 3/F Ortigas Wing of Robinsons Galleria this weekend. So while I’m looking forward to Saturday, my wallet and credit card (they accept CCs!) are already weeping. This entry was posted in food shopping, link love. Bookmark the permalink. be sure to post your Saizen haul next week kaoko! thanks for the info. I would really like to see this since I’ve been in Japan and splurge in their 100 yen stores. I can’t wait! My officemates and I are dropping by the store on the 25th. Planned event samin to. hehe.. Whopee! Hello Kaoko. Great to have Daiso finally in Manila. By chance, did you notice if they have those long chopsticks used for cooking? We’ve been struggling to find those lately. Kyah!!! Now I want to visit it so bad though I don’t know where the exact location is =( I’m not that familiar with Robinsons mall >___<. . . In Osaka there’s another 100-yen chain I like called Seria. Ha! I had self-control when I was there! I envy you! I haven't been there so I don't know how the local branch compares but since it's an official licensee, I'm sure they're supported by the Japan main office. I went there a couple of weeks ago but I can't feature it. I so want to, but they don't allow cameras in anymore. I so want to, especially since I want to highlight the kitchen stuff. So relevant for Kitchen Cow, right? Yes they do! I think I emailed you about it, right? Hope you managed to nab a pair! Is there a Saizen in Robinson's Manila? Please let me know when you visit! I'd love to check it out too. I’ve visited Saizen two weeks ago. It was both a wonderful and disappointing experience. It didn’t have enough bento accessories, except for a few measly Urara bento straps, some very plain generic looking teensy bento boxes (nothing Japan Home probably didn’t put on their shelves at one point or another), sad looking onigiri shapers (J-Wave had better stock) and surprisingly lack of pots and pans (I was looking for a better omu pan). Not even a microwave steamer! I was however able to get some of the last silicon bento cups and some nice veggie cutters so it wasn’t a total bust. hello anyone of yah knw whre i can buy onigiri mold??? pls. do reply im begging yah alll!!!!!!!!!! Nakapunta ako dito, sarap mamili, andaming items na mapipipilian. Try Saizen and Japan Home center. They have it occasionally, depending on stocks. Hahahahaha, agree! So much fun yes? I remember the first time I set foot at Daiso overseas, naloka ako! So happy meron na dito sa atin. I do hope they add more branches. If you have time, bumalik ka na lang at a different time because their inventory rotates regularly. Baka maka-tiyempo ka next time. Good luck sa chopstick case hunt!